ANNUALS ARE A YARDENER'S DREAM! THEY ARE INEXPENSIVE, EASY TO PLANT AND CARE FOR AND GIVE YOU ALMOST INSTANT COLOR IN THE LANDSCAPE. The problem is that Annual flowers are plants that last for only one season. So whether you buy annual plants at the garden center or you start your own from seed ( more of a gardener thing), remember that these colorful plants will not come back again next year, as the perennials do. But that is not a bad thing. 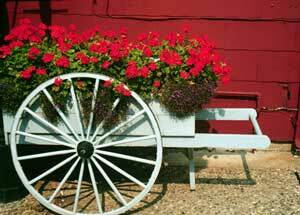 Annuals make a wonderful addition to any landscape or garden bed. Tuck them in as needed to complement or contrast with the other plants you have planted. You can think of annuals as "problem solvers," especially when you want to balance blooming time and color. An annual's blooming period is usually much longer than a perennial's; often for the entire growing season. Wherever an early-blooming perennial has faded away, leaving a drab spot, pop in a fresh annual to perk up the color in the garden bed. BEFORE WE GET TO THE OUTLINE; LET ME OFFER THE DISGUSTINGLY PERSONAL OFFER FROM MY LIFE PARTNER NANCY SZERLAG, GARDENING COLUMNIST FOR THE DETROIT NEWS FOR 16 YEARS. THIS BOOK IS WRITTEN FOR MICHIGAN BUT IT WORKS FOR ANYONE LIVING EAST OF THE MISSISSIPPI RIVER AND NORTH OF TENNESSEE.